Chanteur Country US né Horace Leon Chappelear, le 4 Août 1915 à Tyler (Texas). Leon Chappel a débuté à la radio RWKH de Shreveport (Louisiane) en 1933, et dès 1935, Leon enregistre pour Bluebird Records avec les "Shelton Brothers". 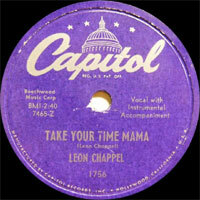 Leon Chappel a aussi enregistré pour Decca et Capitol Records. Il a été membre du "Jimmie Davis' Sunshine Boys". Leon Chappel est décédé le 23 Octobre 1962 à Gladewater (Texas). Leon Chappel remains a sadly unrecognized progenitor of Western swing, later recording a clutch of singles for Capitol that are fascinating for their mutant hillbilly-blues approach. Born Horace Leon Chappelear in Gilmer, TX, on August 1, 1909, he dropped his first name by 1929, when he teamed with friends Joe and Bob Shelton to form the Lone Star Cowboys. After launching their career at Tyler, TX, station KGKB, the three relocated to Shreveport, LA, where they signed to station KWKH. Sans his fellow Lone Star Cowboys, Chappelear made his recorded debut for the Gennett label with 1932's Jimmie Rodgers-inspired "Trifling Mama Blues" before reuniting with the Sheltons in mid-1933 to back singer Jimmie Davis on a session for Bluebird. Davis helped land the Lone Star Cowboys a deal with Victor, resulting in seminal early Western swing sides like "Deep Elm Blues" and "Just Because." 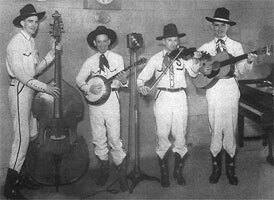 Musical differences nevertheless prompted Chappelear to split with the Sheltons soon after, and after forming a new group he christened Leon's Lone Star Cowboys, his music swerved even closer to jazz, spearheaded by the kinetic fiddle playing of Lonnie Hall and a series of clarinetists. 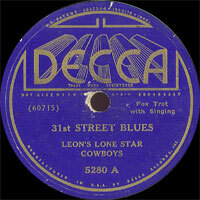 Leon's Lone Star Cowboys signed to Decca in mid-1935, recording just a handful of sides for the label before tragedy struck: while returning from a September live date, the vehicle carrying Chappelear crashed, and he was hospitalized with severe head injuries. Although he survived the incident, there is much conjecture that he never fully recovered, as evidenced by the erratic course of his remaining years; nevertheless, within six months Leon's Lone Star Cowboys were again recording for Decca and playing live on KWKH, although the group relocated to Shreveport station KRMD soon after, reportedly due to subpar performances. Chappelear took the opportunity to shuffle the roster, creating a new 12-piece lineup that was in many respects his tightest and most dynamic, but after a final 1937 session, Decca terminated the band's contract. The next decade of Chappelear's life is in large part a mystery — he effectively retired from music to become a policeman, but his law enforcement career ended in ignominy when he was convicted of accepting bribes, possibly resulting in a prison sentence. From there, he worked for several years as a pipe fitter. 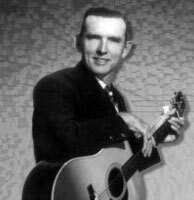 By the time he resurfaced in the late '40s, Chappelear had abbreviated his surname to "Chappel," and was playing in a new honky tonk outfit called the Lone Star Ramblers. Somehow he reconnected with Jimmie Davis, fresh off his first stint as governor of Louisiana, and was invited to join Davis' backing band, the Sunshine Boys. After signing to Capitol, Davis called in a few favors and landed Chappel a Capitol deal of his own. Beginning with his 1951 label debut, "Slow Down Sweet Mama," his latter-day music boasted an almost anachronistic sound marrying bluesy, boozy juke-joint country with trace elements of his Western swing roots. "I'm a Do-Right Daddy" followed that summer, but Chappel did not issue his third and ultimately final Capitol single, "Don't Dog Me 'Round," until late 1953 — by most accounts, he spent the long layoff as a truck driver and pipe layer, and after Capitol dropped his contract, he returned to Shreveport, working at as a superintendent at the city dog pound. Health problems dating back to his earlier car crash continued to plague Chappel throughout his life, and after the disintegration of his marriage, he slipped into a deep depression, finally committing suicide while visiting his sister in Gladewater, TX, on October 23, 1962.